Making folder private in Windows XP would restrict others from accessing that private folder. It would also disable folder sharing feature. 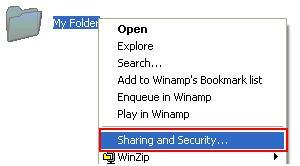 1) Open your Windows Explorer and locate the folder which you want to set private. Right click the folder and click Sharing and Security. If you don't want to make folder private, have a look on this file sharing.